The Historical Urban Art Walking Tour is $5 per person. What is the Historical Urban Art Walking Tour? A guided walking tour designed for young and adult audiences that explores nine public works of art in and around 540WMain Community Center and the Susan B. Anthony District. Who created the Historical Urban Art Walking Tour? The tour was co-developed by the first cohort of teens that participated in the summer 2016 Workforce Development, Entrepreneur & College Preparatory Internship. What information does the tour cover? What is the cost of the walking tour? Walking tours are $5 per person. Proceeds support 540WMain community programming. How long is the walking tour? The tour takes approximately 45-60 minutes and covers about 1 mile of terrain. The tour path covers art works along West Main Street, King Street, and the Susan B. Anthony Park. What are the qualifications to become a tour guide? Tour guides are unpaid and are considered volunteer staff. Internship and volunteers hours are recorded. 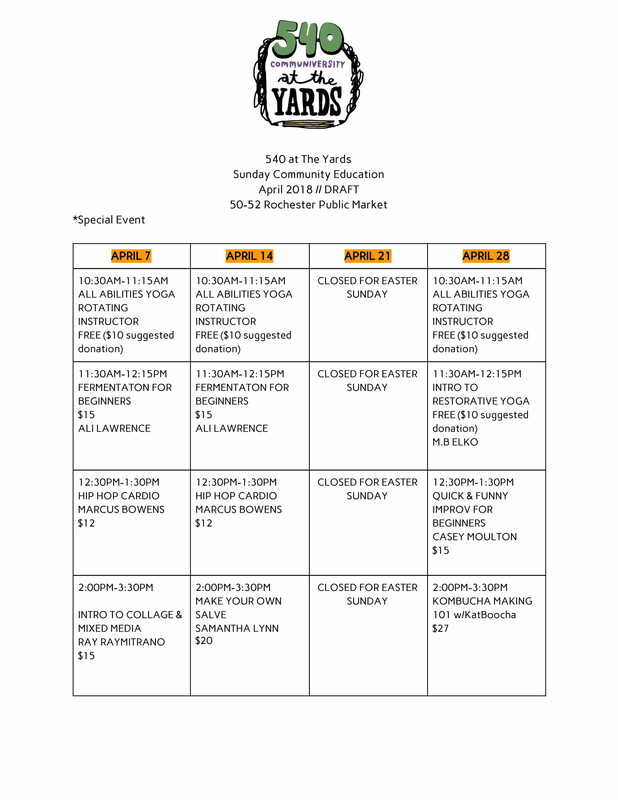 Volunteers are able to attend up to two events or classes per month at 540WMain free of charge. Tour guides will receive at least 3-4 hours of training and more if necessary to feel comfortable. Once trained tour guides are asked to be able to work atleast two tour shifts per month during the tour season. During summer months there are opportunities to work more hours as tours are given on the hour during normal business hours. Tour guides must be reliable. Failure to show for a tour session will result in termination from the tour guide program. What professional skills are enhanced? As a walking tour guide you will improve your communication and public speaking skills. You will also reinforce and build knowledge in the areas of local and regional geography, fine arts, organizational management, public speaking, drama, history & visual arts. 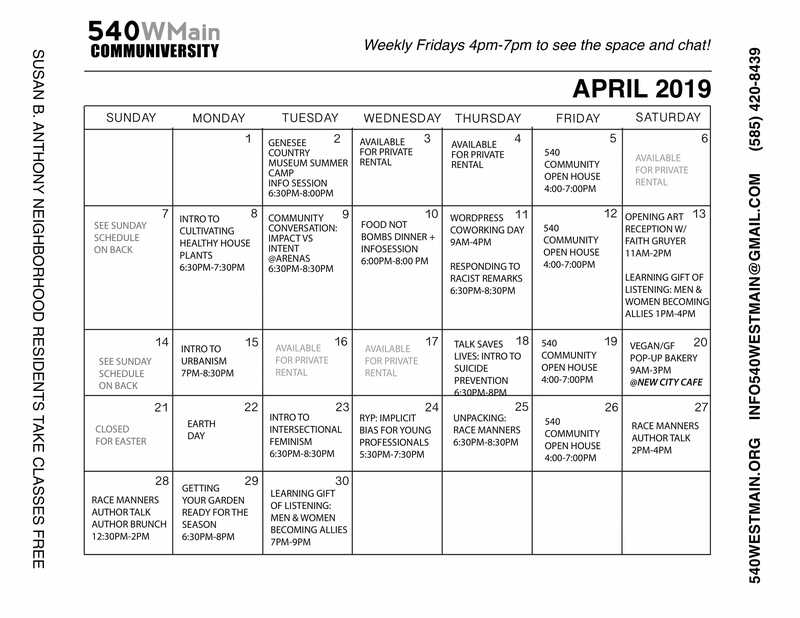 540WMain is a community, art, event, & education center vested in up-building, uplifting, and improving the National Register Susan B. Anthony Neighborhood, its residents, and Greater Rochester. What is The Workforce Development, Entrepreneur & College Preparatory Internship? This is a seven week career focused education and entrepreneur development summer internship. The program provides workforce development training through learning experiences, seminars, workshops, and event planning. Interns collaborate as a team to co-develop, co-design, and co-lead a series of community based project.